The default password for the Linksys E2000 router is admin. This password, like most Linksys passwords, is case sensitive which means, in this instance, that you cannot use uppercase letters. You also need to use admin as the username. Some Linksys routers don't require a username, but the E2000 needs to have one. To access the E2000 router, use the default IP address 192.168.1.1. Enter that address into the navigation bar in your web browser to reach the login page for the E2000. Help! The E2000 Default Password Doesn't Work! Incorrect Password Entered Into a Router. It's always strongly recommended to choose a password that's complex and hard to guess. This is probably why you can't get into your E2000 router — you've changed the password away from admin to something more complex, which is good! If you've forgotten your custom E2000 password, you can restore the router's configuration to its factory defaults, which will change the password to admin once again. Make sure the E2000 is plugged in and powered on. Turn the router around so you can see the power cable and network cable plugged into the back. Locate the Reset area — it's a small hole with an even smaller button inside. With something small and sharp, like a paperclip, press down on that reset button for around 5 seconds. After you let go of the button, wait a good 30 seconds for the router to finish resetting. Now unplug the power cable from the E2000 router for just a few seconds, and then reattach it. Wait another 30 seconds for the router to finish booting up. 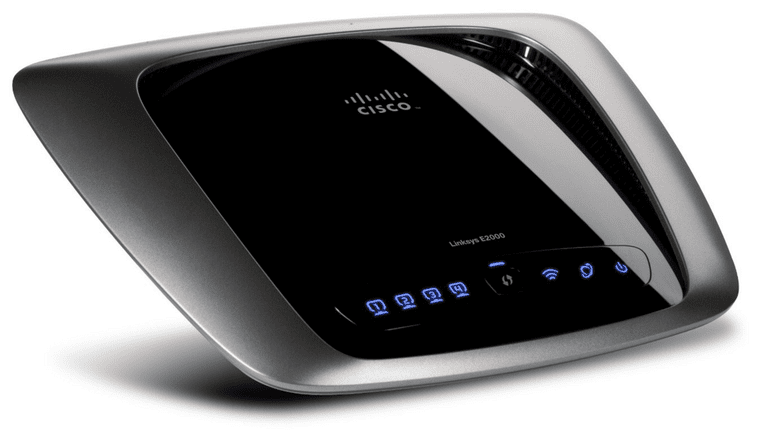 Now that you've restored the settings of the Linksys E2000 router back to their default state, you can log in at http://192.168.1.1 with the username and password admin. At this point, it's important to change the default password to something much more secure than admin. If you're having trouble coming up with a hard-to-guess password, see these strong passwords for examples. To avoid this problem in the future, and instead of writing your password down on a piece of paper (not recommended! ), you can store the new password in a free password manager. Remember that because the router has been reset, you have to reconfigure any other custom settings you had before it was reset. If you had a wireless network, you'll need to reconfigure the SSID and password; same with DNS server settings, port forwarding settings, etc. After you fill in all your custom settings again, it'd be wise to back up the router's configurations so that you can avoid having to re-enter all this information in the future if you ever reset the router again. You can see how to back up the router's configuration settings on Page 34 of the E2000 user manual (there's a link to the manual at the bottom of this page). Wrong IP Address for a Router. Most people don't ever change the default IP address used with routers like the Linksys E2000. However, if you have, it means that you can't access it with the default IP address. Fortunately, you don't need to reset the router again in order to find out what it is or to reset it back to ​192.168.1.1. Instead, you just have to figure out what the default gateway is for any computer that's currently connected to the router. See How to Find Your Default Gateway IP Address if you need help doing this in Windows. The Linksys website has everything you need to know on the E2000 router, on the Linksys E2000 Support page. The Linksys E2000 Downloads page, specifically, is where you go to download the most recent firmware and Windows/Mac Connect Setup software. Here's a direct link to the Linksys E2000 manual. This user manual for the E2000 router is a PDF file, so you'll need a PDF reader to open it. With some routers, there are multiple hardware versions and therefore multiple firmware download links. In those cases, it's extremely important to download the correct firmware file. With the E2000, there's only one hardware version, so you can use the one and only firmware download link you see in the Hardware version 1.0 section of the download page.